Introduction: Journeying by boat to visit their beloved spiritual father, , Constantine Palamas – the father of St. Gregory – suddenly realized he and his family had forgotten to bring food with them for the monastery. While his wife and five children looked on, he raised his voice in prayer and put his hand into the sea; immediately he caught a massive fish. Taking it out of the water, he glorified God for the miracle. Out of his great admiration and respect for the monastic life, Constantine Palamas worked a miracle so that his family would not arrive at the monastery empty-handed. In this way, and in countless others, he instilled in the hearts of his children a firm love for and reverence of monasticism. This practice of going out into the wilderness to seek a word from a holy monastic is a tradition well established in the Church as early as Christ’s own times. St. John the Forerunner was the first monk, and people sought him out, as St. Andrew of Crete testifies: “The Forerunner of grace dwelt in the desert and all Judea and Samaria ran to hear him.” He, like many of our prophets before him, preached amendment of life. The central difference between him and the prophets, however, was that St. John would become the first and greatest “Father of Monasticism.” Generations of monastics would take his way of life, his asceticism, his bold dedication to discipleship to Christ as the epitome of the monastic life, and they would follow him. “Verily I say unto you, Among them that are born of women there hath not risen a greater than John the Baptist” (Matt 11:11). The radical lifestyle of St. John changed the world, especially the Christian world, because many who came after him decided to imitate him and live outside the cities solely for Christ’s sake. Thus, slowly the monastic life was established, and those in the world began to look to it as a shining example of the Christian lifestyle. It is an indisputably great and ancient practice of those living in the world to make pilgrimages to monasteries. Below are five of the many reasons one should. One of the greatest benefits of visiting a monastery is the spiritual conversation and activity pilgrims are able to take part in. At a monastery, spiritual stories and uplifting anecdotes abound. Although many monastics shy away from conversation with pilgrims for a variety of reasons, given the appropriate circumstance a conversation with a monastic can rear a multitude of benefits – not to mention conversations with fellow pilgrims. Whether they share a story they have heard, wisdom from the Mothers and Fathers of the Church, or even a tale from that monastery, their words inform and enlighten the pilgrim and help refocus his busy mind. Even time relaxing in the world does not refresh the soul the way a spiritual conversation does. This type of conversation, though found more rarely in the world, is often a common occurrence at a monastery. Furthermore, many monastics, despite not living in the world any longer or dealing with its struggles and temptations, have great wisdom to share. Not only did they also once live in darkness (Matt. 4:16), but they have a wealth of experience from speaking with pilgrims who confide in them. Through prayer and reading, the monastic manages to help the pilgrim approach his problems with a bit more clarity and even a new perspective. When a monastic bakes bread, he bakes for the glory of God. When he chants in church, he chants for the glory of God. When he sweeps, he does so for the glory of God. And when a pilgrim partakes of such God-honouring work, he begins to look at his own work in a different light, just as the monastic offers all his work for the glory of God, so too can the pilgrim – both while at the monastery, and when he returns to his work in the world. 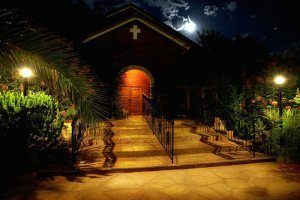 The Christian home is a microcosm of the coenobitic monastery; when the mother, father, or children clean the house, they too can do so for the glory of God. The fallen human soul is predisposed toward pride. 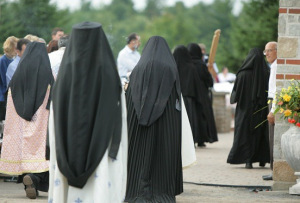 This is something that occurs with the monastic as much as with the layman. When the Christian keeps his prayer rule faithfully, observes the fasts of the Church, or attends church services regularly, the soul is inclined to become puffed up. The antidote is finding better examples than oneself of Christian dedication to remind the proud soul that she is lacking in virtue. The layman has the ability to make pilgrimages to monasteries and so finds a helpful means to stay grounded in his spiritual life. Encountering monastics reminds the pilgrim that there are better Christians than himself (not that he cannot also learn this in the parish, he most certainly can, but it is an indisputable fact that one is faced with at a monastery). Hence the famous statement: “Angels are a light for monastics, and monastics are a light for the world.” The monastic is simultaneously humbled and enlightened by reading the lives of the saints, just as the layman is when he compares his life with that of a monastic. 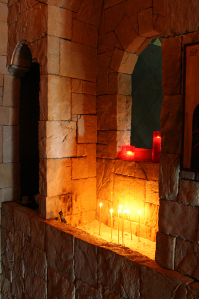 Humility is a virtue that the monastic and layman ought to strive for above all else, for as St. John Cassian says, “Humility of soul helps more than everything else; without it no one can overcome lewdness or any other sin.” And so, the layman makes pilgrimages to monasteries in order to draw the soul away from the distracting world and into an environment of stillness and prayer, where the atmosphere is conducive to taking stock of one’s life alongside that of a dedicated monastic, and to allow the grace of the monastery to help him see his own sinfulness. And so it is with the pilgrim from the world. In the stillness of the monastery, he is able to reflect on his failings. Whether it be in comparing his spiritual life with the monastic who left all things behind to live “alone with God alone,” as Elder Porphyrios was wont to say, or simply due to slowing down and reflecting on his faults, the pilgrim returns to the world with greater humility of soul. St. Theodora, Matericon, 85. The command to imitate Christ is found throughout the Gospels. He is the image of perfect obedience, extreme humility, utter chastity, and a life of poverty. To be sure, if a believer only ever read the Gospels, he would be informed on how to live a proper Christian life. However, because man is weak and in need of examples, the monastic life illustrates the Gospel commandments lived out to their perfection. Thus the layman has before him a pragmatic example of how the teachings of the Lord are upheld and practiced. In turn, he emulates those things in an appropriate and prudent way, just as St. Paul encourages: “what ye learned and received and heard and saw in me, these things be practising; and the God of peace shall be with you” (Phill. 4:9). The only difference between a Christian living in the world and a monastic living in a monastery is that monasticism “rejects any kind of compromise and seeks the absolute”, whereas the layman struggles as best he can in the midst of the distracting world. Both are acceptable and blessed in the eyes of God. Both ways are only successful by the grace of God. The layman should not be disheartened by his struggles in “the darkness of the world” (Eph. 6:12). Rather, he should take courage that he is upheld by the prayers of countless monastics, as Bishop Nikolai of Lavreot has stated: “The life of the faithful is supported by the prayers of the monks. This is elucidated by the very fact that the faithful take refuge in such prayers. Just as Moses stretched out his hands and the Israelites conquered the Amalekites, so the monastics lift up their hands to God and we, the faithful who are struggling in the wilderness of this world, conquer the noetic Amalek.” And more significantly, the layman should take courage that “where sin abounded, grace did much more abound” (Rom. 5:20). Even if there were no other reason for visiting a monastery, there would remain this one: it is an agios topos, a holy place. “And Moses said, I will go near and see this great sight, why the bush is not consumed. And when the Lord saw that he drew nigh to see, the Lord called him out of the bush, saying, Moses, Moses… loose thy sandals from off thy feet for the place whereon thou standest is holy ground” (Exodus 3: 3-5). Coupled with the prayers of the monastics, the saints that dwell within the monastery, and the angels that protect it, there are also at least one or more chapels. The presence of a temple of God alone is enough to sanctify a place. And it is in this sanctified place that even without hearing God-inspired words or witnessing miraculous events, the pilgrim is refreshed. His weary and tired body and soul are nourished with more than monastic fare – they are nourished with monastic stillness. St. Nikolai Velimirovich records: “When [St. David of Garesja] arrived at a hill from which Jerusalem was visible, [he] began to weep and said, ‘How can I be so bold to walk in the footsteps of the God-man with my sinful feet?’ David then told his disciples that they, being more worthy, should go to worship at the holy places, and he took three stones and began to return.” The saint’s humility was so great that he considered the sight of the Holy Land and even its pebbles to be overflowing with grace. How much more does the grace of a sacred place exceed sight and stones? In this sense the words of St. Theodora hold an even greater significance: “Love stillness. One who is not attached to the vanities of this world is strengthened in soul by stillness, abstinence and silence.” This strength, harnessed by the grace of a sacred place, can then be brought back into the world if treasured and safeguarded through prayer and watchfulness. In conclusion, “if you want to know if someone loves Christ, find out if he loves monasticism,” as the saying goes. Visit monasteries, acquire humble-mindedness, and abstain from judging others – both the believer who is too lax and he who is too strict. “Wherefore seeing we also are compassed about with so great a cloud of witnesses, let us lay aside every weight, and the sin which doth so easily beset us, and let us run with patience the race that is set before us, looking unto Jesus the author and finisher of our faith” (Heb. 12:1-2). All photos that appear in this article belong to Nektarios and are used with permission. The Great Canon of Repentance, Song 9, . Archimandrite Zacharias, The Enlargement of the Heart, 174. Monk Isaiah to Honourable Nun Theodora, Matericon, 160. St. Nikodemos, Handbooks of Counsel [Greek], 15-16. St. Symeon the New Theologian, from Dr. Constantine Carvanos’ article A Discourse for those living in the world, Orthodox Info:http://orthodoxinfo.com/praxis/discourselivingworld.aspx. Abba Apollo, Sayings of the Desert Fathers, 36. Philokalia, St. Diadochos of Photiki: “On Spiritual Knowledge and Discrimination: One Hundred Texts”, vol. 1, , 255. St. John Climacus, The Ladder of Divine Ascent, op. cit., 128. Abba Dorotheos, Practical teaching on the Christian life, “On the Fear of God,” , 113. St. John Chrysostom, Pros piston patera (To the faithful father) 3, 14, PG47, 372- 74. Constantine Carvanos, Discourse on those living in the world, Orthodox Info:http://orthodoxinfo.com/praxis/discourselivingworld.aspx. St. Nikolai Velimirovitch, Prologue, May 27. Through the prayers of Apostle Paul — “Go, for he is a chosen instrument of mine to carry my name before the Gentiles and kings and the sons of Israel; for I will show him how much he must suffer for the sake of my name.” (Acts of the Apostles 8:40; 9:1-19), St. Lydia’s of Thyatira, Apostle Paul’s first convert to Christianity in Europe (cf. Saints-Readings Today), and all the Saints, Lord Have Mercy on us, Amen. Another ‘coincidence’: Tomorrow, God willing, on Saint Konstantine’s the Great and Saint Helen’s Feast, both Saints intimately related to the Holy, Life-giving Cross, I ‘return’ to my ‘thin place’, the parish of Holy and Life-Giving Cross at Lancaster. Glory to God for all things! A retreat! Amidst various Lenten temptations and “the purifying draught of dishonour, sneers, derision and insults”! Mikrokastro monastery is my haven of peace, silence, hesychia and spiritual refreshment under the protecting Veil of the Theotokos. The grace-filled presence of Panagia Eleousa and the mesmerizing beauty of the Akathist Vigil at Mikrokastro monastery have offered me, again, a timely refuge! How difficult at times to show patience in annoyances and unmurmuring endurance of scorn, disregard of insults, and the habit, when wronged, of bearing it sturdily; when slandered, of not being indignant; when humiliated, not to be angry; when condemned, to be humble”, but how difficult does this feel! (St. John Climacus, Ladder of Divine Ascent, Step 2:8) Indeed a narrow path to theosis! For you alone are a hope to us. Silence has always been blue to me! you are satiated, be silent. If you are hungry, also be silent. Pilgrimages are like crossing a desert. They can be painful if taken seriously, and can even be dangerous. They are painful because they crack the shield of one’s comfortable certainty that things can only be done one way. In truth, nothing is one, except Faith itself; by comparison, the manners in which this faith ‘becomes flesh’ are countless. There are as many shapes and nuances of the faith as there are human beings. This is a painful lesson to learn, but it is absolutely necessary. Without this understanding, one loses sight of the personal nature of any spiritual experience. There are as many prayers as there are sighs, and there are as many sighs as there are human hearts. There is no rule on Heaven or earth to regulate the outpouring of love or pain of one’s heart. 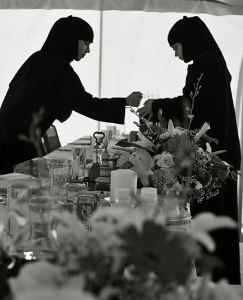 Suddenly, ‘The’ traditions of your local region become just that: local traditions, creations of a certain historical and cultural context which reflect the faith. 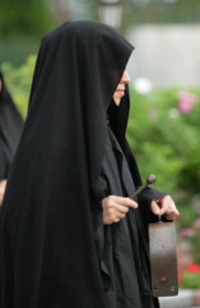 As a pilgrim, you unavoidably find yourself immersed in a different context, a different embodiment of the same faith – other customs, other ways to pray, other saints and prayers, all embraced by the faithful in that region with the same absolute conviction that these local expressions of faith are ‘The’ only expressions of faith. Pilgrimages can also be dangerous and may lead (paradoxically) to a weakening of one’s faith. To some extend, this is a natural progression – when you grow in your faith, there is a moment when it becomes clear that what you previously held to be absolute truths are actually not. There are always other ways to express one’s faith. If you are weak of heart, this process of leaving your past behind may be a dangerous moment, and you risk losing your path while crossing the desert. However, if you take courage and press forward, the Spirit will lead you to a new understanding – a higher one, a more loving one, embracing the endless diversity of the personal ways in which we manifest our One Faith. When you leave behind the comfort of your home, prepare yourself for the dangers of the desert, but don’t lose heart: at the end of it all, God has already prepared a better, higher, more spiritual home for you. “The first stage of tranquility consists in silencing the lips when the heart is excited. The second, in silencing the mind when the soul is still excited. The goal is a perfect peacefulness even in the middle of the raging storm.” (Ibid, Step 8.4) The Ladder of Divine Ascent is also known as The Monastic Bible. In many monasteries, it is a tradition to read this book during Trapeza meals throughout Great Lent. For the suffering of subtly afflicted hearts. Mikrokastro is a village in northern Greece, near Siatista in the Kozani district. It derives its name from Mount Kastraki which lies on the other side of the village. This mountain is on the way to Saitista and is known for the massacre which occurred there at the hands of the Turks in November 1912, which is the year the inhabitants gained independence from the Turks. The monastery of the Dormition of the Theotokos was founded in 1753 and houses the miraculous icon of The wonder-working icon of Panagia Eleousa, Theotokos of Mercy, dating back to 1603, maybe as back as the 13th century, wondrously alive, even to the remotest ‘corners of the world’. The monastery at one time operated an old age home, an orphanage, and a hospital for sick children. During war times many sought refuge and sustenance from the monastery, and in turn the people loved the monastery and the bishop who made it a center of the people’s lives. The monastery is the heart of western Macedonia and is truly a place where the command to “love one another” is exemplified. Yearly on the 15th of August the male inhabitants of Siatista parade with their horses (the Cavalry of Siatista) in a procession of the icon from the monastery to Siatista. In Siatista a party ensues and the men dance on the baks of the horses while the wine flows freely, and people break their fasts with a great feast among friends and family till the early morning hours. This festivity goes back to Ottoman times when the Turks granted the inhabitants one day of freedom to do as they wished according to their traditions, and the men would ride their decorated horses to show their leventia (Greek word for manliness and courage). For Christ, being risen from the dead, is become the first fruits of those who have fallen asleep. Leave a comment Posted in Chanting and Sacred Music, Churches And Monasteries, Pilgrimages Tagged Agni Parthene, christ is risen!, It was embittered!, Lenten Fast, Lenten Temptations, Mikrokastro Monastery, Pilgrimages and Retreats, PILGRIMAGES: PAINFUL AND DANGEROUS DESERTS, Simonopetra Monastery, Supplicatory Canon to the Most Holy Theotokos and Ever Virgin Mary, The Catechetical Sermon of St. John Chrysostom, The Ladder of Divine Ascent, The Paschal Sermon, Why pilgrimage?